“PTSD” – Post Traumatic Stress Disorder – is the result of physical or emotional trauma. Most often associated with combat, it can be caused by any kind of painful experience. Physical violence, childhood abuse or exposure to very frightening input of any kind can contribute to PTSD. This guided meditation for PTSD can help bring relief. Whenever we experience events that are overwhelmingly painful, part of us is left behind, until we’re able to heal and release the pain. Carrying the memory of a traumatic event is a bit like living in a house with a room that’s closed off. We never want to enter that room because of the painful feelings it holds. But we can’t clean it up and remodel it without going through the door. 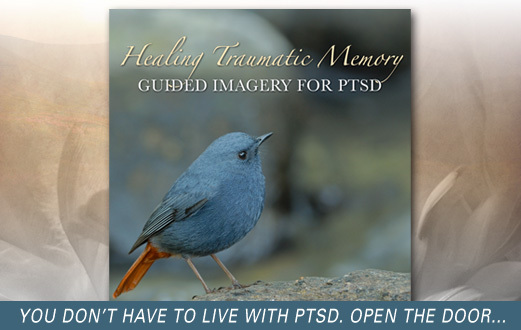 So in this guided meditation for PTSD, with gentle narration and soothing background music, you’ll have the opportunity to heal painful memories without reliving them. You’ll visit the past through a protective filter to clear out negativity, without stepping into it again. You’ll be able to do this in a way that’s safe, comfortable, and effective. "There’s a little stone cottage up ahead, one that looks as if it’s been here for ages, with a small garden in front, a stone chimney, painted shutters by the windows, and an old wooden front door. Coming closer, you see there’s a paper note pinned to the door, and as you step up to it you’ll see your own name on the paper, followed by the words, Come In..."
"In my years of clinical work at the VA in Los Angeles, I cared for many returning soldiers suffering from PTSD. This is the sort of program I wish I'd had available to use as an adjunct to therapy. I've known Max Highstein's guided imagery work for quite a while, and his recordings are always of the highest quality. I'd recommend this new recording for therapists and their patients dealing with post traumatic stress." Georgea Muschel, L.C.S.W. "I had a profound experience with this meditation. I only listened to it once, because that was all I needed!" -- customer testimonial, name withheld for privacy. Traditional treatment for PTSD usually involves talk therapy and prescription medication, but research has been pointing toward guided imagery for PTSD as a safe, natural alternative that allows you to heal without re-traumatization. This self healing meditation can help you get past road blocks you've created, healing wounds from the inside out so you can move on and recover, without bringing back painful memories. Guided imagery is a medically endorsed option that helps PTSD victims when traditional approaches do not help. Guided meditation is now being used to help PTSD victims of all kinds, including children who are afraid to eat after anaphylaxis and soldiers returning from combat. The U.S. military even employs this strategy to help active-duty soldiers recover from PTSD and reduce symptoms with great results. It's never too late to heal, so don't give up!